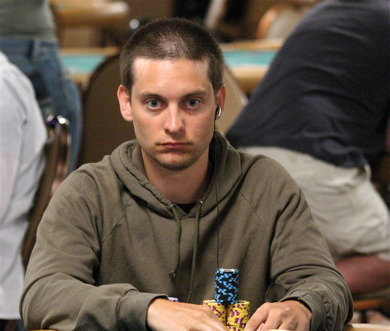 Spider-Man star Tobey Maguire is just one of the celebrities sued for winnings at unlicensed poker games at upscale Beverly Hills hotels during 2006 and 2009. The legal actions against him have been taken by bankruptcy trustee Howard Ehrenberg, who attempts to recuperate money for investors that were duper in a Ponzi scheme, Associated Press reports. The court records show that the illegal Texas Hold’em matches were played in Beverly Hills hotels between 2006 and 2009. The Card players won hundreds of thousands of dollars from Bradley Ruderman. Howard Ehrenberg filed the lawsuit in March 2011, claiming that the players have no rights on keeping the money earned from Ruderman, since the matches weren’t licensed. There is a number of 22 people that are caught in the poker lawsuits web. Tobey Maguire is sued for 311,000 dollars plus interest. His lawyer, Robert Barta, was not reached for comment, but he is expected to release a statement later this week. Another celebrity facing charges is actor/ director Nick Cassavetes, who directed “The Notebook”. He is being sued for 73,000 dollars plus interest. His attorney, Ronald Richards, claims that his client took part in only one game in 2007 and there are no records showing that Ruderman paid for his client’s games. He might as well have lost the money himself. “The theory that is being advanced by the trustee is what we call a novel or original theory,” Richards said. The list of the defendants continues with billionaire Alec Gores, who is being sued for 445,000 dollars. Attorney Patricia Glaser stated that “there was nothing improper about the poker game that is the subject of this lawsuit” and said her client was not accused of any wrongdoing. “Mr. Gores will either successfully resolve the claim against him or successfully defend against the claim,” she stated. Lawyer Patricia Glaser represents yet another celebrity in the poker lawsuit series: “Welcome Back Kotter” star, Gabe Kaplan. He was sued for 62,000 dollars. Bradley Ruderman received a sentence of ten years in a federal prison earlier this year. He pleaded guilty willful failure to file taxes, to two counts of wire fraud and two counts of investment adviser fraud.